Meet Deuce. Deuce is part of a community of people, survivors of a catastrophe in the not-so-distant past, who are forced to live in abandoned subway tunnels, heavily secured and guarded against the dangers that lurk outside their enclave. 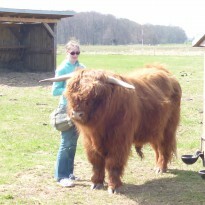 The community leaders’ sole goal is to ensure the survival of the species. Emotional bonds in any form are discouraged. When a person comes of age (at age 15), he or she gains the right to a name and is sorted into one of three categories: either builder, breeder, or hunter. And they seem strangely accepting of this exclusive setting of their future. Due to the deprivations and hardships of living in these underground conditions, where food and light are scarce and danger abundant, a person hardly grows to be 30. Deuce was born into this enclave and had wanted to be a huntress for as long as she can remember. Fade is an outsider who has been grudgingly permitted into the community. The two of them are paired to be a team of hunters. On their first excursion outside the relative security of the enclave, they are attacked by the Freaks roaming the tunnels, freely killing whatever and whomever they encounter. More so, Deuce and Fade realise that these freaks work systematically and not at all as mindlessly as their leaders had made them believe. The show signs of advanced intelligence, endurance, and strength. So, not enough with having the disadvantage of only being a relatively small number of survivors, they are also clearly the underdog when it comes to mental and physical assets. That doesn’t bode well for the golden survival of the species. Deuce and Fade’s warnings that the enclave will surely fall prey to the freaks if they don’t prepare/unite/escape fall on deaf ears. Not only are their warnings ignored by the elders, Deuce and Fade are exiled for their audacity to spread doom and gloom in their little community. Exile meaning certain death in these surroundings. But somehow they make it to the top and into even more dangerous situations, which they escape, not unscathed but with additions to their little team. And then things get even more complicated, because: EMOTIONS. Deuce discovers feelings she’s never learned how to deal with. After reading this book, many questions remain, which may or may not be answered in the second. Of course, a 15 year-old girl, who has never met anyone older than 30+ and who has therefore no chance at having any knowledge of the events that caused the catastrophe, cannot provide the reader with an account of what had happened to cause mutations in people to leave them with a craving for dead bodies (to eat!!). A virus is hinted at, but how that affected the victims’ brains and started the blood craze or why they suddenly seem to evolve cannot be explained satisfactorily by Deuce. They might have a chance of getting some of the answers they seek themselves as much as the reader in the next instalment in the series, since they have met people that exude wisdom and knowledge (white hair and other indicators of old age). Whether or not these newly found gerontocracy will be able to answer questions about the present state of events as much as those about the past remains to be seen. I would like to know how come that the Freaks evolved into beings who organise to make a concerted effort to eradicate those not affected by the supposed virus, while neither the survivors underground nor those topside have learnt how to fight the threat and secure a better life. The fate of every great people – standstill? Ha! 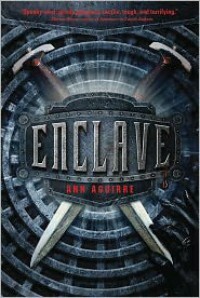 I was not super-enthusiastic about Enclave, but it was interesting enough to keep me reading. The inescapable love triangle might cause even more violence than usual – and thus be done with quickly. And at the very least, I will not be treated to a moping and self-pitying heroine – I hope! No, the author surely wouldn’t turn Deuce into one of those, overwhelming new emotions or not, would she?